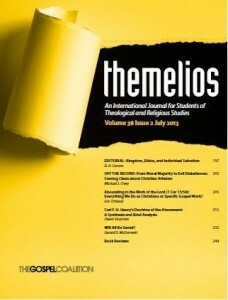 The Gospel Coalition just released the latest issue of Themelios. It is available as a 158-page PDF and in HTML. We've also partnered with Logos Bible Software to make it available as a free mobile-friendly Logos digital edition for use on all major platforms with one of their free apps. Peter Orr | Abounding in the Work of the Lord (1 Cor 15:58): Everything We Do as Christians or Specific Gospel Work? Gerald R. McDermott | Will All Be Saved?